White Papers: history never repeats? Defence Minister David Johnston got a late Christmas present in the form of the National Archives’ release of Cabinet papers from 1986 and 1987. In this trove—surely among the last Cabinet papers to be produced on typewriters—we see the Hawke government’s consideration of the 1987 Defence White Paper and the decision to purchase the Collins Class submarine. In foreign policy, there are papers on the military coups in Fiji, on China’s economic reforms under Deng and on Australia’s relations with Japan and Indonesia. Tony Abbott’s ministers have a chance to see how their predecessors of a generation ago struggled with policy options that are still remarkably relevant to the present day. I’ll blog later on the submarines and on foreign policy and concentrate here on the 1987 White Paper. Never one to suffer false modesty, Gareth Evans launched the release of the Cabinet documents by saying that ‘the story of 1986 and 1987 is essentially that of a competent government… at pretty much the top of its form’. It’s hard to disagree. The Hawke government cantered to a third election win in July 1987 and in the middle of its second term had a stable and talented line up of senior ministers. 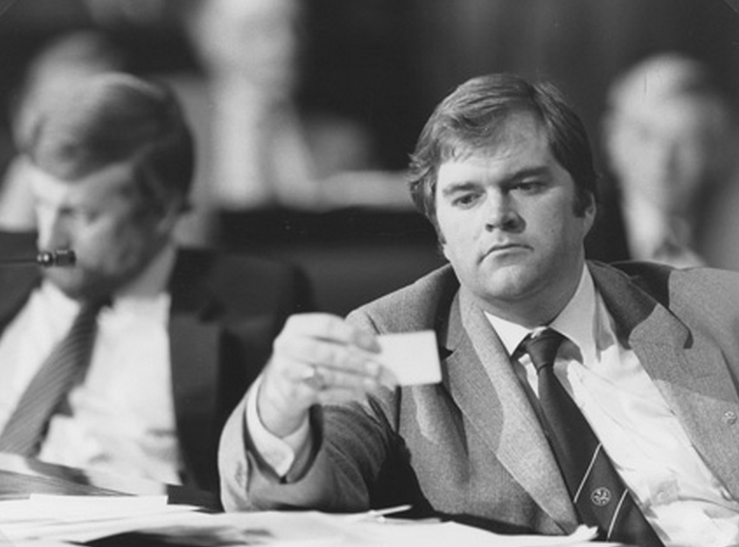 In Defence, Kim Beazley, who had several years’ tenure as minister, already had the benefit of Paul Dibb’s March 1986 Review of Defence Capabilities to provide the policy thinking which formed the basis for the 1987 White Paper. The February 1987 Cabinet submission seeking endorsement for the white paper is, therefore, the product of a government which had already worked its way through the key issues. The submission itself is only seven pages long (plus attachments) and focuses on how the White Paper has been written to take account of criticisms made of the Dibb Review. For example, the submission uses the term ‘defence in depth’ rather than Dibb’s ‘denial’ to counter claims that the strategy was too reactive. And it says that additional consultations were held with allies after Dibb’s review was seen to be too focused on a ‘fortress Australia’ approach. Whether or not these criticisms were correct, the key point is that Beazley’s white paper process identified and mitigated problems before the White Paper was locked into policy. Contrast that with the Asian Century White Paper, where Julia Gillard bizarrely handed Ken Henry the right to bring his report to Cabinet not as the work of a reviewer but rather as an expression of Government policy. Cabinet got a take it or leave it choice to sign up to some wildly optimistic goals without ever testing whether the Asian Century concept would float. In Defence, the 2013 White paper owed more to pantomime than policy-making. In an accelerated effort to deliver the white paper before the 2013 budget the opportunity never existed to test the credibility of its policy settings. Imagine, dear reader, the interdepartmental bloodletting that took place to remove the words ‘a consistent allocation of resources’. Something which is consistent though, is the tone and content of the Department of Finances’ coordination comments. Noting that Defence spending was touching 2.9% of GDP, ‘Finance questions whether the current share of GDP should be maintained… in the light of competing economic and social objectives. Finance suggests that over the next five years economic imperatives may well dictate little or no real growth in defence outlays if the Government’s policy of budgetary restraint necessary to correct economic imbalances is to be achieved’. Finance lost the battle to change the White paper’s public finding parameters, but they won the war in the late 1980s and early 1990s to either cut or keep Defence spending at zero real growth. Now that the Defence budget hovers around 1.6% of GDP will Finance stop calling for reductions? Not a bit of it. You can bet that whenever the next white paper is brought to Cabinet, Finance’s position will be exactly as it was in 1987. What lessons can we take from the 1987 white paper experience? First, the new government should get its policy development processes right. That means not rushing a white paper as happened in 2013. Rather, put a process in place which can attract comment and review before a white paper is locked into policy forever. Second, give Cabinet the opportunity to think policy options through well before drafting a public document. Third, accept that the financial realities will force compromises on defence plans. The painful truth is that no defence spending plan set out in the last generation has lasted more than a year or two. On Defence funding, history repeats with absolute regularity. It’ll do the same in 2015 unless a careful white paper process is designed in 2014. Peter Jennings is executive director of the Australian Strategic Policy Institute. Image courtesy of National Archives of Australia.